Agnes Callamard, UN Special Rapporteur on Extra-Judicial summary or arbitrary Executions. Two independent United Nations human rights experts have called on the Iranian Government to halt the execution of three prisoners from the Kurdish community, amid concerns that they did not receive a fair trial and allegations that they were tortured while in detention. Executions of cousins Zanyar and Loghman Moradi, and Ramin Hossein Panahi – detained at the same prison – are due to take place on Saturday. “We urge the Government of Iran to immediately halt their executions and to annul the death sentences against them in compliance with its international obligations,” said Agnes Callamard and Javaid Rehman, Special Rapporteurs on arbitrary executions and on the human rights situation in the country, respectively. According to the Office of the UN High Commissioner for Human Rights (OHCHR), Zanyar and Loghman Moradi were arrested in August 2009 for the alleged murder of the son of an Imam in Marivan, Kurdistan province. They were subsequently held at an intelligence detention centre for nine months without formal charges or the opportunity to challenge the legality of their incarceration. “During the trial, they both denied the charges in court and explained that they had confessed to the crimes only due to torture following their initial arrest,” said OHCHR, noting that the Iranian Supreme Court upheld their convictions, and that the allegations of torture was not investigated. The news release also stated that fears of their imminent execution have been raised amid reports that they were transferred to solitary confinement on 5 September, their families asked to visit them, and their access to telephones restricted. The experts also reiterated their previous calls to halt Mr. Panahi’s execution – reportedly due to occur at the same time – and annul his death sentence in light of reports that he did not receive a fair trial and has been tortured in detention. Mr. Panahi was arrested last June for alleged membership of the Kurdish nationalist group Komala, was repeatedly beaten in detention, denied medical care and access to a lawyer, and held in solitary confinement until January. 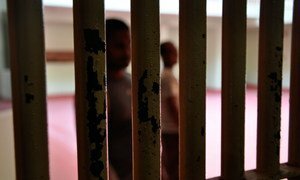 A group of United Nations human rights experts have called on Iran to annul the death sentence against a prisoner citing serious concerns that he was tortured in detention and did not receive a fair trial.